Bubbles at Home, Inside & Outside! 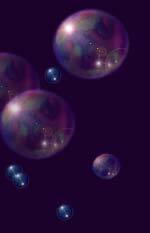 I was in the former Honey Bear Bakery one morning blowing a few bubbles for the children who would usually gather around my table and one young man came up to me and in a matter of factly voice said to me, "Bubbleman. Bubbles are an outdoor activity." 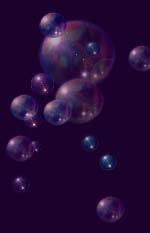 I don't remember my response but I decided to write about bubbles as an 'indoor activity'. The following are some helpfool hints on how to blow bubbles indoors. Buy 2 bottles of bubbles and put the soap of one into another bottle and rinse that bottle clean. Leave a little bit of water in the bottle, put the wand inside and replace the lid. This is the bottle you give to your child who eventually will spill the little bit of water. (But it sure beats spilling bubblejuice everywhere). Lay a wool blanket on the floor and blow bubbles on it. The bubbles will not break on the blanket until your child pops every one. The child will probubbly want to blow bubbles too so s/he has their bottle and by the time they figure out how to open the bottle you are blowing bubbles with your bottle. Their wand is wet and your child can CATCH your bubbles if you show them the GENTLE approach. Now you are having so much fun you realize it's time to refill your bottle. Do you want to see your child laugh uncontrolabubbly? 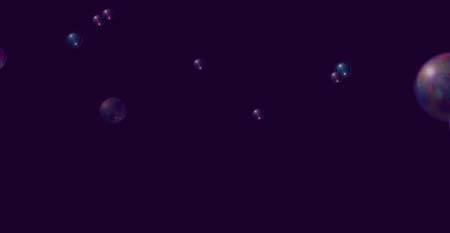 (Personally there's no better sound in the Universe.) Slowly blow a bubble until it gets so big it pops in your face. Do this repeatedly and soon you are both laughing hysterically. mix 15 parts water to one part Dawn or Joy in a five gallon bucket. Tie a six-pak ring on a stick and let the bubbles fly...gently. This can entail hours of fun AS LONG AS you do not create any suds. NO SUDS! If your solution gets sudsy, skim the suds off the top into another bucket. They eventually become more bubble juice. The best part is that this bubbler has no batteries, electricity, or computer game programs. And your child is outdoors getting exercize and fresh air. And it's important you are part of their fun as well. I've invented dozens of ways to make a bubble. I invite you to find your own way to maintain your child's attention without batteries, electricity, or computer game programs. Show them the power of their own imagination.